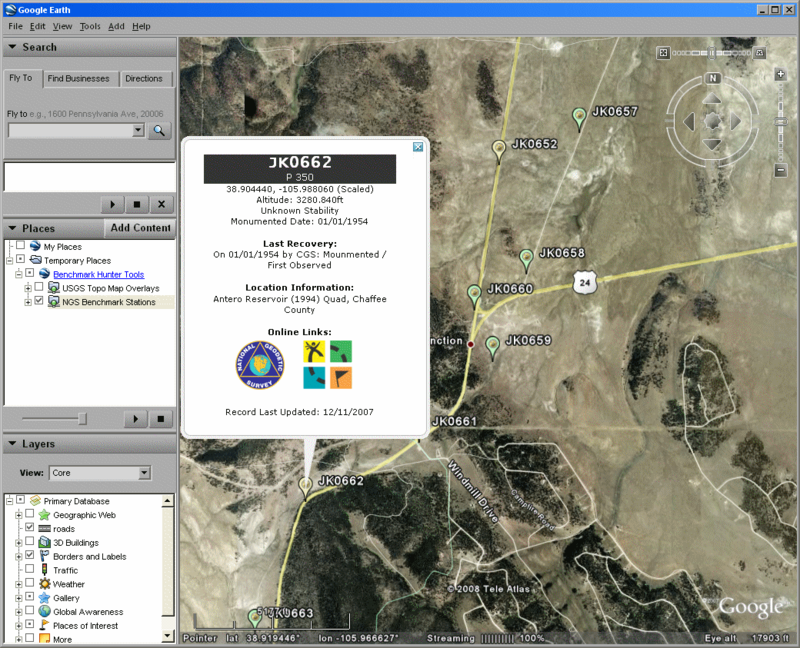 The Google Earth NGS/USGS Overlays are free to use, for personal and commercial use. However, donations are always welcome and appreciated! The KMZ file here will add two options (each individually selectable) for data display: USGS Topographic map overlay image, and NGS survey markers with info balloons. The USGS Maps range between 1:100k to 1:50k to 1:24k, depending on the zoom the view of GE. The overlap maps come from TerraServer, this server simply translates GE's request into the request that TerraServer can understand. None of the maps are hosted directly on this server. NGS Survey markers will be displayed on the map if that selevtion is enabled. The station's marker gives quick details on wether the station is a survey marker ( ) or an intersection station ( ). The color gives information on the last recovery - green indicates a good or poor recovery. Yellow indicates that the station hasn't been recovered since it was monumented. Red means that the station was reported not found. White indicates an unknown of lack of recovery, like a CORS station. Clicking on the marker will open the ballon, showing information on the station, including location information, last recovery information, and any initials of Geocaching rcoveries. Clicking on the NGS or GC logo will open a browser window to that station's page or datasheet. Stations last updated on 12/18/2014. The utility is pretty basic and easy to use. Enable and disable layers (USGS Maps & NGS Stations) by enabling or disabling the checkbox next to the layer. Important to note: The marker data is NOT live from the NGS. THe last update date is above. Google Earth has a bug, where if you click to view the online datasheet of GC page, and then scroll the map to reload stations, GE will crash if the URLs haven't been launched yet. I recommend to make sure that both layers are fully refreshed before clicking on a station's link, and do not move the map until the URL has opened (in Google Earth or your external browser). Screen 1: In Google Earth, all options enabled. Topographic map and survey markers, with one marker's info bubble open. Screen 2: Same location as above, without topographic maps. White/Missing Topo Maps: Sometimes and in some locations, maps will not load. 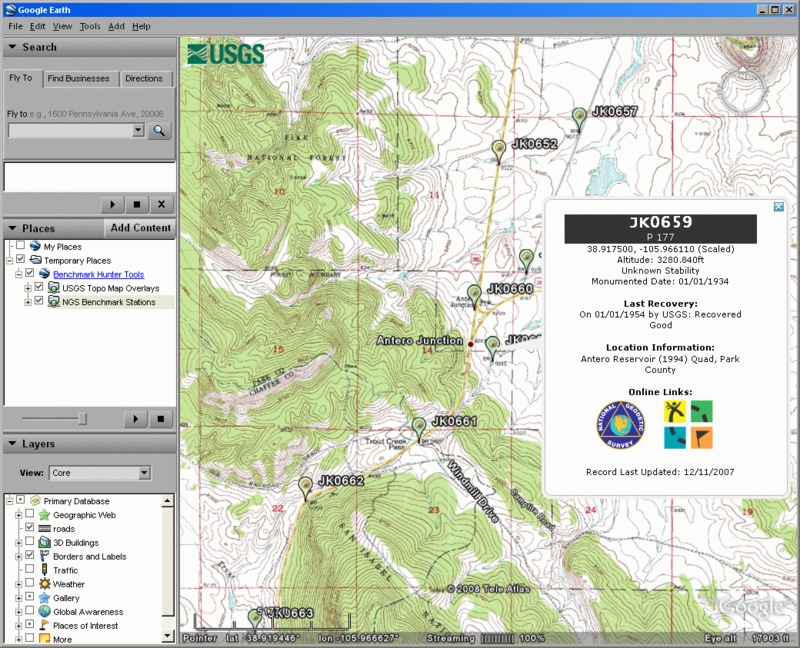 Maps are loaded from the USGS Servers and sometimes certain locations will not load maps correctly. There is nothing I can do about this at this time.